MuscleTech Phase8 Review – What is it, really? MuscleTech Phase 8 is an entry-level protein supplement/meal replacement powder that has everyone shaking their heads. If you’ve scoured the internet for protein powder deals lately, you might have come across MuscleTech Phase 8’s buy one, get one offer. It’s quite an interesting offer, since most protein supplements are just the same. Most protein supplements only vary by type of protein used and flavor. At the end of the day, it’s still protein that you’re taking. According to the majority of reviews we found, many were put off by MuscleTech’s unorthodox combination of ingredients. A quick examination on the ingredients list revealed that MuscleTech Phase 8 is not a pure protein powder product. It has an unusual combination of protein and carbohydrates, which are not what you usually see in a protein product. MuscleTech Phase 8 claims that it can provide complete, sustained 8-hour release of protein, which is probably where it got its name from. The idea is to use different types of protein that break down differently, resulting in a lasting protein release. It’s a proven fact that muscles need time to rest and recover to fully develop, and that’s where MuscleTech Phase 8 claims to work by efficiently releasing protein over time, as your muscles recover from your intense workout. There’s no quick way to measure effectiveness since protein powders are typically designed to work over a long period of time. What customers had to say about their experience with Phase 8 tells more about the product than what is on its label. Majority of the customers who ordered this product online discovered that the powder is terribly messy to mix. The powder gets sticky at times, and it’s hard to clean the hard-to-reach areas of your mixer with parts of the powder stuck in it. According to people who have used Phase 8, the consistency is more like drinking milk with solid parts, as some portions of the powder don’t mix quite easily. Solubility is important since the unmixed powder wouldn’t be absorbed by the body as efficiently as a properly-mixed product. MuscleTech Phase 8 contained far more carbohydrates than what most protein supplement users would want in their protein mix. This slight change in the formulation doesn’t just affect the results; it affects who would buy the product for its effects. Fitness enthusiasts buy supplements for a number of reasons, but the most common of these reasons is to cut fat from the body and build up muscle mass. High concentrations of carbohydrates are typically found in supplements which are designed to replace meals, which assist in maintaining a fitness regimen. MuscleTech Phase 8 contains too much carbohydrate per serving to be a typical protein powder, and not much carbohydrate to replace meals. Some websites we’ve visited classify MuscleTech Phase 8 as a protein supplement, which is what we think it should be if not for the carbohydrate content. Even so, the protein content makes customers ask if it is indeed a protein powder since it contains just slightly over 60% of protein per serving. That’s about 24 grams of protein per scoop, and if you would compare it with the best supplements for muscle gain, you’d learn that MuscleTech Phase 8 has below-average protein content per serving. Given the below-average protein content and the fact that Phase 8’s protein content would be distributed over 8 hours makes people wonder if there would be changes since the protein digested by is spread thin over the delay in digestion. 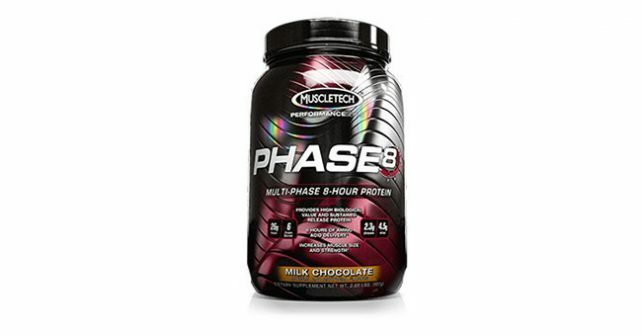 There’s not much to watch out for with MuscleTech Phase 8. There are several other products that can help develop muscle – ones that offer a complete set of solutions that can help you get ripped fast. If you’re looking for an alternative to protein supplements, check out NitroGenix 365.